Hello. today, i went into my neighbourhood canadian tire store - they would not honour their price as in the flyer and as posted on their shelves. 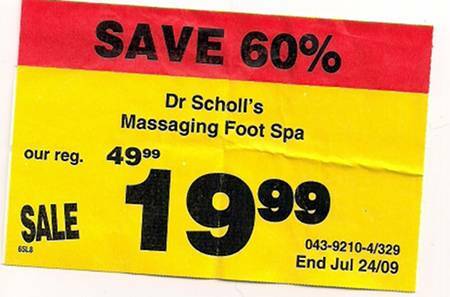 The manager directed me to the “fine print” on the flyer and I have sincerely feel ripped off - So, be aware, check the fine print at Canadian Tire - i chose the only item on the shelf that was Dr. Sholls, there were about 6 of those shelf price tags, “sale tags”, saying Dr. Sholls foot spa 19.99 - when i objected to the 69.99 price i was charged at the check out and subsequently asked to see the manager, he approached me and said nothing, only looking at me, then saying “okay, okay, i’ll go look” - he then sent someone else out with a Sunbeam replacement, and the employee told me that there was a mistake: the price tags and flyer should have read : Lancaster and Sunbeam foot spa - not dr. Sholls foot spa - when I asked to speak to the manager (again) i was told I would have to wait, waited 10 more minutes and the manager approached and said “what now”, literally. He was defensive and advised me to contact customer service, which I did, see below and I will keep you updated as/if this develops. Won’t be going there again. I went to your Delta Superstore with a good intention. I went to customer service with a bar of mozarella cheese that is moldy that I have purchased Jun 29/09 with a expiry date of nov 17/09. I did not have my receipt with me. I was hoping just to get the cheese replaced and tought not having a receipt will matter and make you aware of the bad product I have bought for $3.00. the response I got from cust. service is- I have to take it back to the store where I bought the cheese which is about 10-15 mins. drive. because they may have a problem with refrigeration and that they have no poroblem at their store, or that I may have left it in the car and cause the cheese to go bad.this is a $3.00 value of purchase. (I bought the cheese at your king george store), since we were at the delta store to look at the bbq we tought returning it will not make a diff. where you buy or purchase the item. then I asked for the manager cause the cust. serv. clerk did not look at my problem nor did not try to understand what I was trying to explain. I asked for the manager and the manager’s response was - they don’t take back dairy products and more so not having a receipt that I have to take it back to the store where I have bought from. My frustration is - I was not trying to return and get money back, I wanted the store to be aware that this is a 3 week old product that I have purchase, expiring in nov/09 and has turned really moldy with a cost of $3.00. and all I wanted was a replacement. Driving to the originating store will cost more than replacing. I felt no emphaty and no understanding from the clerk and the manager with what I was trying to convey. Could have been just a simple make the customer happy for a $3.00 value of cheese. !!! In my frustration and rather than going into an argument and creating a scene. I resulted in throwing away my cheese in the garbage. I have been a long time customer of superstore. 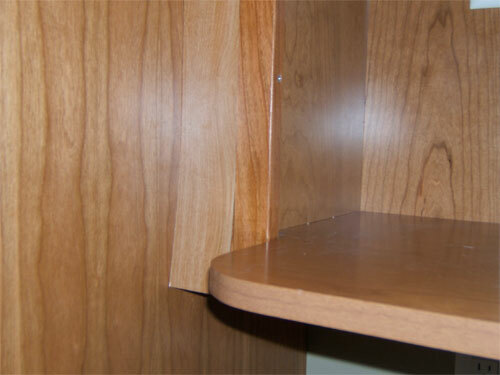 I have returned items with and with no receipts with values of more than $3.00. I have been a customer of The Real Canadian Superstore since it opened in Alberta. My son & I were in store # 1566 on July 9, 2009 & upon leaving the store my son was stopped by a gentleman at the exit door. My son was taken back by this as we have never been stopped leaving one of your stores before. I have to admit that my son is not subtle & develops a rude attitude very quickly so when he was asked to stop, he basically stated “What the f— for?” The gentleman asked him for the receipt. My son attempted to keep walking & he was again asked for the receipt. At this point, my son yelled at me as I had already walked through the exit door. I passed the receipt through the small opening left as the door was closing & then opened the door manually & went to stand beside the gentleman. I did not hear what my son said but I’m sure that he was rude & the gentlemen looked at him & said “If you don’t like it, don’t come back”. Even though I had not heard what my son had said, I definitely heard this gentleman tell my son not to come back. When I challenged him on this statement & the way he was talking to my son he told me “If you don’t like it don’t come back” At that point, I was infuriated at the lack of respect & customer relation skills of this gentleman so I took my receipt out of his hand & left the store. On July 10, 2009 I returned to this store with my daughter to speak to the store manager regarding the incident the day before. I was disgusted to find out that the gentleman that I had dealt with on July 9, 2009 was actually the store manager. I attempted to speak to him about how he had treated my son & I the previous day. As I started to speak, he interrupted me & told me that I did not hear the whole initial conversation with my son. I then stated to him that I know how rude & obnoxious my son can be however, that did not give him the right to degrade & demean another human being. I again attempted to speak with him to try & somehow resolve this or to at least receive some acknowledgment that the situation could have been dealt with in a more appropriate manner. This gentleman attempted to take over the conversation & turn it all back over onto my son (who certainly is responsible for being rude) & would not let me speak. I forcefully then asked him to stop talking & listen to what I had to say. He then said he would listen but within less than a minute he was again interrupting me by talking about having a responsibility to his 400 staff & 5000 customers. I let him know that I did not have a problem with loss prevention as I have worked for a major Canadian retailer as an inventory control supervisor & know how much money that can cost a company. This gentleman still showed me no respect & would not listen. I let him know that I was contacting Head Office & lodging a formal complaint against him. His response was “Go ahead, I’ve had lots of complaints laid against me” as he walked away from me. This situation was dealt with in front of the Assistant Manager & the staff at customer service. It was very apparent that they were all embarrassed to be there & the Assistant Manager would not look at me at all. As this gentleman walked away, I said “this is the disrespect I am talking about”. He completely ignored me & waved his hand in the air as if to say “get lost” & kept right on walking. After my experiences over the last two days, I have decided that my grocery dollars will be better spent elsewhere. I will not return to the Superstore for anything that I have always purchased there. I will be transferring my husband’s prescriptions from your pharmacy as well. My children are in support of me & will not be purchasing their groceries, gas, liquor or cigarettes from any of your stores either. I would think that in times where people are pinching pennies & watching where they spend their money, retailers would ensure that their customers are treated with respect & that any complaints are dealt with in a reasonable & fair manner. Where has the idea gone that without customers, retailers & their employees don’t have a job? I really don’t care for the rip-offs at Sears — it makes my blood boil. I HATE THIS COMPANY AND WOULD SUGGEST IF YOU CAN … BOYCOTT SEARS. Anyone know how to get ahold of anyone in management to actually complain, or do they care? Latest … I had cashed in my points from purchases in time to get a gift card … hmmm. Well, I’ve been in the store many times but thought, no need to buy anything just yet. Don’t see any clothes for my daughter (who’s 2), nothing for me … “I’ve got this card, but why spend it right away”… anyway, the day I go to spend it last month and put it towards my already reduced purchase … won’t scan. Cashier contacts the office … is told that the card expired. If I had used it within a couple of months after expiry they still would have honoured it, but they couldn’t honour it now — too long. Heck. I had made purchases to get the points in the first place. What a sham. Have to say, wasn’t the cashier’s fault that she was set up and I tried to be calm with her. She was really a sweet helpful lady and told me that Sears is now owned by Chase Manhattan bank or some other financial company or other. I can’t remember. She really tried to help me as I racked up to her all the rip-offs Sears has caused me. I really DO HATE SEARS for all the grief and monetary losses to them over the years. I would love to boycott Sears yet I’m a large woman and it’s still one of the only places I can shop (via catalogue) for any 1/2 decent plus sized clothing. They hold a monopoly on my home appliances too. Mind you, I have recently discovered some very nice lines on the Shopping Channel and have moved some business that way. Anyway, time and time again with Sears … THIS CUSTOMER IS NEVER RIGHT. My husband and I bought a mattress from them 9 years ago. Well, it popped a coil that went through the mattress. Guess what — they had to have record of the purchase — heck, it says Sears warranty on the mattress, why would I lie? Then, they had to send the “Bed Doctor” out to take a look and coaborate that the mattress did indeed have a hole in it caused by a spring. Well, I was to call — you know what I got from being told on the mattress that it was warranteed for 10 years — THE YEAR I BOUGHT MY MATTRESS (2000/2001) at that time the warranty was pro-rated. Therefore, for every year I’d had the mattress it decreased in value — I was eligible for all of $350.00 towards the purchase of a new mattress. And, they told me that they would tell the store that I would be coming in to make a purchase of a new mattress with that amount applied …. NOT. Would you believe, they actually had the audacity to call me back and see if I was going to use that money. (I can’t swear, but I’d like to here). Now, apparently too, the later models, there is no depreciation on a mattresses’ value. Or, so I’m told. Other things: I had a service warranty on my washer and dryer — do you think they ever pay me a courtesy call to remind me that the year is up and they should do service … NOPE. When I read the fine print on my washer - the hose should be replaced apparently every 6 years — I told the appliance man — I wanted a new hose — (the machine’s 9 years). Then the company called to tell me the service warranty was expiring. Do you know what they were asking on a 9 year old machine — $240.00 bucks a piece I believe — that $580.00 for 2 items. I laughed at the rep. — can you imagine, I told her “for that money, I’ll be investing in a new machine when mine breaks down”. ht, I realize that you can purchase items over the phone on your card, but the sales person had misled me to believe no transaction was going to be formalized until I was in. If that wasn’t enough — she wasn’t the one telling me it was a manager who really appeared to snicker. I was out the $500.00 deposit. (Mind you, my parents recouped me that since they were the ones who’d eventually talked me out of going and pursuing my opportunity to get the time off in the first place). One final story — did you know that the same item in the store can be cheaper than the item in the catalogue. They don’t necessarily have to be charging the same price. I found this out when I went shopping with a friend. I got the exact T-shirt she had boughten in the catalogue cheaper and reduced for a price lower than hers. With the ticket incident still fresh in my mind, I told her not to let it rot and do something about it — somehow she succeeded where I always fail with this company and she got $50.00 back in merchandise coupons. Good for her, but made me even more ticked. Please, don’t get me wrong, I always have a level head when I’m speaking with the staff. IT’S SUCH A COMPANY WITH SUCH A BUREAUCRACY AND I’M FINALLY RELIEVED AND GLAD TO GET MY FRUSTRATIONS OUT HERE IN A PUBLIC FORUM. Thanks for listening. I hope no one’s had it so bad with Sears as I have and hate them …my uncle even was employed with them for many many years. I’d love for them to set things right and replace the wrecked bed this time … what they can do without paper trail anymore on the cruise stuff isn’t likely, but at least to treat me as the very best customer. Other suggestions of places to shop so that I can boycott Sears would be great. Also, reading the comments about Wal-Mart. My hubbie has worked for them for over 14 years. They do listen to the customer so make a complaint to Head Office. Also, they would rather serve the customer than themselves. Sorry for the bad experiences. Not all’s true what you hear/see/read hear in Canada. What I will say those is some stories — PEOPLE HAVE NERVE and it only takes one or two to wreck it for everyone. My husband can tell a story of a person who (when the old policy was they would accept ANY returns, without receipt) of a person who literally had bought an outfit for Valentine’s Day and returned it day after Valentine’s … used. Of course, they even got their money because that was the policy! Now, I always check receipts. As Cam indicated, a lot of stores will make scanning errors — I’ve caught a few myself. For this reason, as Zellers has, I often scan before I buy and I know where I picked up products, know if it looks like they’ll be a discrepancy and try to be a wise consumer. That obviously doesn’t hold with my continuing to shop at Stupid Sears. Love to hear comments about experiences with that store. 1) I got the silver razor (which they had in store, and I was waiting for the black one to come in) Well I got stuck with the silver. No big deal. 2) They got my name completely wrong which caused a lot of problems when I tried calling them to sort it out. 3) They put me on a 3 year term (not what I asked or signed for) and then was told that I would have to pay for cancelling the 3rd year. 5) Every month and I mean EVERY month, there was something wrong on my bill (my sister’s too) and I would have to call and spend forever on the phone to get it sorted out. This isn’t even all of it. However if you are lucky enough to have FIDO….They are great!! !